Why Standards Meetings Are Always Entertaining! Can You Tell Anything About The End Of A Fiber From An OTDR Trace? Should You Use Dry Water-Blocked Cables Near Salt Water? This Month there is no "Tech Puzzler"
TIA Standards Meetings were held in early February 2012, as usual with some interesting issues on MM vs. SM fiber, encircled flux (EF) and bend-insensitive multimode fiber (BIMMF) being hot fiber topics. 100G networks and older fiber designs also were topics of controversy. Several new issues were discussed. The controversy over MM vs. SM fiber in 100G networks continues. The 10x10G MM parallel solution that requires 20-24 fibers has not been well received, so a 4x25G solution has been proposed. Unfortunately, cheap 850 nm VCSELs don't work well at those speeds, making only the 1310 nm CWDM solution on SM currently feasible. Perhaps MM fiber is facing a fate similar to UTP at higher bitrates. ISO/IEC Standards Working Group WG3 decided to accept a UK proposal to remove OM1 (62.5/125 fiber) as a recommended medium for structured cabling standards. OM2 (50/125 fiber) is expected to be removed from future Fiber Channel standards and is likely to disappear from other standards in the future. What happens with people who have large investments in these earlier fibers who need to expand their networks and have no use for the bandwidth potential of OM3/OM4 fibers and/or do not want to worry about mixing fiber sizes? BIMMF Technical Issues Fading – And New Ones Surfacing! Bend-insensitive MM fiber controversies are fading as manufacturers begin to understand how to design and build them. The current view of the publicly-aired controversies of last year now seems to be "never mind!" However, one attendee privately shared with us a pair of very interesting OTDR traces of what an OTDR shows on a splice between BIMMF and regular MMF (see below). Who would have guessed that MMF could show such a gainer! This is just another proof that OTDR tests are NOT indicative of actual cable plant performance! 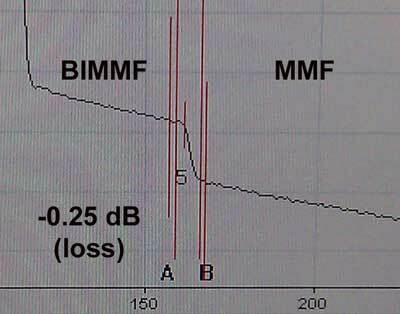 OTDR traces of a joint between BIMMF and regular MMF. 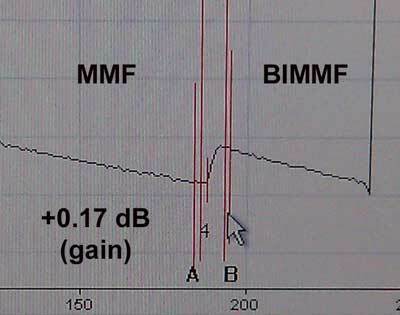 The higher scattering of the BIMMF causes a big “gainer” in the reverse direction, illustrating why OTDRs should not be used to test cable plant loss. If you tested the end-to-end loss of this link with an OTDR in one direction only, the loss would have been 0.42 dB different than in the other direction. If you averaged the two per normal OTDR practice, the loss would be 0.04 dB, but with a backscatter gain of 0.21 dB, what loss is real with these two fibers? Just before the TIA standards meeting in February, we were contacted by a test equipment company who asked us if we were willing to tell the group that some test equipment companies believed that the new OFSTP-14 which includes a requirement for encircled flux was neither feasible nor needed for field tests. We offered to not only do that but poll other test equipment companies and maybe some other manufacturers about their opinions. We asked seven test equipment companies. Five agreed that EF was not appropriate for field use. Two thought it was fine, but they were reselling Modcon mode conditioners along with their high-priced test gear, figuring their customers could afford $3000 or so for mode conditioners. We also talked with several other manufacturers of fiber optic components. One, who had been involved with EF since the beginning, offered that "EF was never intended for field use" and confirmed saying it when I repeated it back to them incredulously. Another manufacturer complained that even using EF in the lab was proving problematic! Furthermore, several of those polled complained that the new OFSTP-14 was poorly written and organized-not even giving you a diagram of the test configuration until the appendix! As expected, the committee response was quite negative to say the least! But later in the day, EF cropped up several more times, including during a presentation that showed that using a short patchcord with a mode conditioner to reduce wear and tear on its connector (which requires a return to the factory to be reterminated!) negated its effects, while the presenter tried to claim the opposite! Others noted that testing EF was still not possible to calibrate. A round robin to determine if EF measurements can be correlated between labs is still probably a year away from conclusion. The discussion then focused on the fact that EF is hard to use in the field and probably not even appropriate except for 10G OM3/4 networks. However, no one knows yet how to undo what they have done. Perhaps more startling was the discussion that concluded that if the new OFSTP-14 was not appropriate, the prior version could still be used and remains available for purchase! That’s why it has been repeatedly suggested that FOA write its own standards for field use by contractors, designers, installers and users. Which we have already done. "The U.S. economy benefits tremendously from the multiplier effect of the information and communications technology (ICT) infrastructure investment. Growth in the ICT sector not only creates jobs in manufacturing ICT equipment and deploying physical infrastructure, but also leads to economic growth through the creation of new businesses, services, and technologies in other sectors of the economy. For example, your proposal to develop and deploy a nationwide wireless broadband public safety network would create an estimated 100,000 new jobs in ICT industries and, over time, produce indirect benefits of an estimated $4 to $8 billion per year. Moreover, the $3.4 billion investment in ARRA for smart grid deployments could produce nearly 30,000 new jobs, while acting as seed money for a fully-deployed ICT-based smart grid with economic benefits ranging from $48 to $76 billion per year." Fibers In The Sewers? Not a Joke! For some years, people have chucked at the news that fiber is being run through the sewers in cities. You might remember the Google April Fool's joke about TISP, a fiber to the home project where you flushed the cable down your toilet. Well, if you see the equipment yourself, you learn that it is a very serious business that requires sophisticated equipment and practices but can save lots of money for a city wanting to install optical fibers without digging up all the streets. We recently visited the Florida offices of "CableRunner" and saw the actual hardware used in installations. Leopold Zeindlhofer showed us how the CableRunner system works. 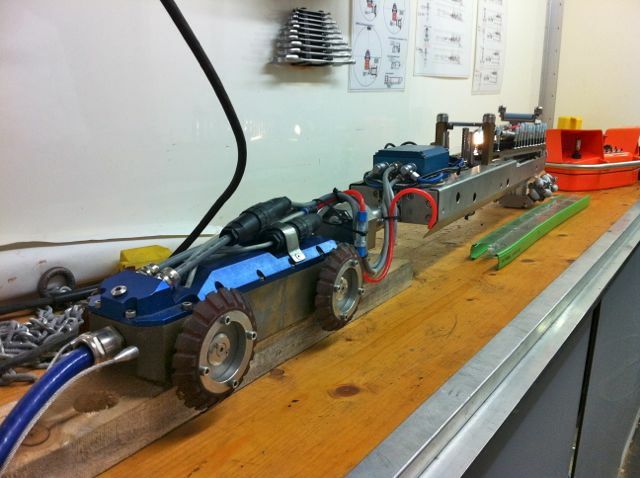 For small to medium size pipes, wheeled robots like this install special cable trays along the top of the pipe in a well-orchestrated process. In larger storm sewers, a vehicle that actually seats two workers runs along the pipe floor while the workers install special cable trays on the top of the pipe. The cable tray, shown below, comes in snap-together lengths and is screwed to the top of the pipe where it will generally not be immersed in the water in the pipe, as the pipe needs some air to allow proper flow. This particular tray shows two cables of blown-fiber tubes, another option to running regular cables. Once you see the hardware sophistication developed for putting cables in the sewers, you understand it's no joke. They have trucks equipped for the installation process that provide power and compressed air to the robots and multiple video feeds back to the operator in the truck to monitor the progress of the installation. For more information, see cablerunnerusa.com. Because of its importance to users, contractors and installers of fiber optic networks, The FOA and NECA have agreed to make the NECA/FOA 301 Fiber Optic Installation Standard available free to FOA members. Standards usually cover components and systems and how to test them, but rarely get into installation issues. This standard is derived from FOA educational material put in standards form and approved by ANSI as an American National Standard. It's specifically written to be used in contracts to define "installation in a neat and workmanlike manner." FOA members can go here for instructions on how to download your free copy. Ever need a quick reference to a standard but can't find a copy? Have you tried to read some of the documents and given up because of the "standardese" language? Have you been disappointed to find the standards were written by manufacturers for manufacturers and aren't relevant for contractors, installers or users? Or have you ever tried to buy a standard and just about fainted when you found our what it cost? Well, we've heard all those complaints for years. And we're doing something about it. FOA is embarking on a new program to make standards more accessible to the world of users, contractors, designers and installers. We will start creating "One Page Standards" - simple explanations of standards that you use all the time but don't need the originals; you just need to understand how to use them. We'll cut out all the fluff and give you the info you need. 'A document established by consensus and approved by a recognized body that provides for common and repeated use, rules, guidelines or characteristics for activities or their results, aimed at the achievement of the optimum degree of order in a given context'. Well, that certainly sounds like what the FOA is doing! As you all know, FOA certification is now internationally accepted and our technical references the first choice for unbiased, technically correct information on fiber optics and premises cabling. It's certainly logical that we would next try to put some order in the chaos of current standards. FOA standards are developed by FOA members whose expertise is in the technical areas covered by the standards and whose field experience in the industry contributes to FOA standards being accurate, relevant and current. FOA now offers standards for testing the installed fiber optic cable plant, patchcords and cable, optical power from transmitters or at receivers and OTDR testing. Look for the "1 PageStandard" web page and in the FOA Online Reference Guide. 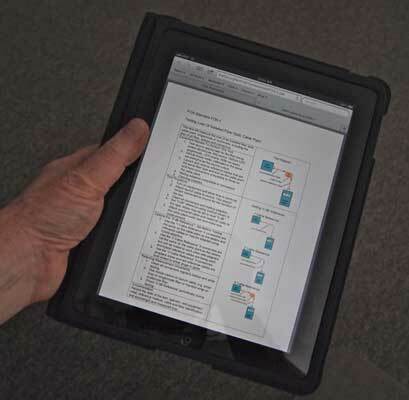 Download the FOA 1Page Standards to your tablet or smartphone! Some OTDR manufacturers tell you their instrument is smarter than you are so all you need to do is to attach the instrument to the cable plant you want to test and push the "AUTO-TEST" button - let the OTDR do the work. Well, the trace below was sent to us by a frustrated customer who was give a bunch of traces like this from an installer to "prove" the installation was done properly. He called the FOA and asked us "what does this mean?" After we stopped laughing, we told him we doubted the installer had a clue what he was giving the customer. Then we explained what the trace meant. As you can see, the installer at least used a launch cable long enough for the test but did not use a receive cable on the far end to test the connector on that end. The OTDR could not resolve the 75 foot long cable under test (about 23m) at 1300 nm, indicating a gain of 0.39 dB on that fiber due to the interference of the overload at the first connector. Reflectance overload affects both traces as you can see, leaving us to also suspect the loss of the first connector on the 850 nm trace. However, that did not stop this OTDR from saying that this cable was a "PASS" - 5 times no less! Out of curiosity, we asked the OTDR manufacturer why this happened. We were told that this unit would "PASS" anything unless the operator changed the limits. 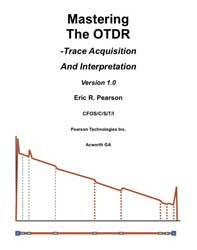 Many of the technical questions we get here at the FOA deal with OTDRs and many are problems caused by untrained operators expecting the OTDR to do the trace interpretation for them. That is almost always a recipe for disaster! If you are going to use an OTDR, learn how to use it first. Start with the new Fiber U OTDR self study course, "Understanding OTDRs". You can also download the Free FOA OTDR Simulator to practice analyzing traces. "The total IT energy consumption in the US in 2011 is estimated to be slightly more than 100 Billion kWh2. (This is based on the energy consumption being 80% of the 2007 projection.) The actual consumption may be lowerdue to the economic times. Energy costs vary per state and usage classification and contract agreements. At a commercial national average price of 10.77 cents per kWh,3 the total IT energy consumption cost is estimatedto be $10.77 Billion. 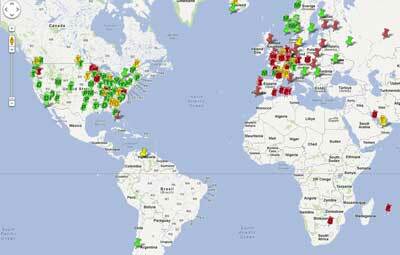 Annually, Billions of kWh of IT energy go unmonitored and largely unmanaged. A large part of the consumption is inefficiently-used energy by local area networks and supporting infrastructure"
Read the complete Cirrant report here. 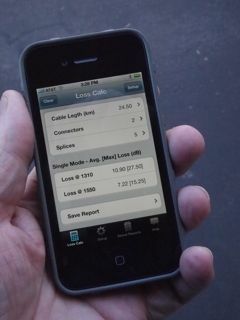 The FOA has just released its second APP for the iPad/iPhone/iPod Touch, a free "loss budget calculator," FOA LossCalc. Fiberizer is a iPhone/iPad APP that reads industry-standard ".sor" format files and allows trace analysis on your iPhone or iPad. An android version is in the works too. 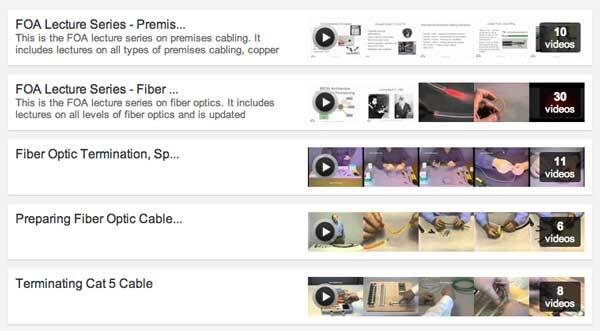 10 new lectures on premises cabling have been added to the FOA YouTube channel along with a lecture on fiber to the home - FTTx, making 25 fiber optic lectures total. Should competitors unite to provide broadband? Should utilities be brought into the mix too? Should the united organization get tax breaks for cooperating to get broadband to everybody? Steve Rivkin, Washington Telecom Lawyer, has some interesting ideas on this subject. Read his article here. OFC/NFOEC is the #1 fiber optic conference and show in the USA if not the world, with more than 500 companies displaying the cutting-edge products and technology that will define next generation networks. The ONLY place you can see and meet with all the major players in one location. Where is the optical communications market going? Attend Market Watch sessions and gain insight into the latest system and component drivers and uptake, and roadmaps for this market. FREE Admission to the exhibits and extensive business programming in three show floor theaters. More information. 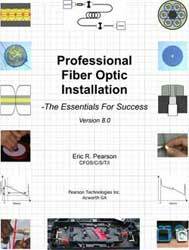 A good snapshot of the fiber optic technology/industry is the paper "Optical Communications in 2012" paper from the organizers of the OFC conference. Fiberfest is the one day conference/trade show run by the New England Fiberoptic Council. This year the event will be colocated with a FTTH Council meeting in Boston. Watch for details here or on the NEFC website. There are two new free online self-study programs on Fiber U. 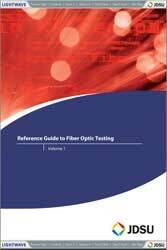 "Outside Plant Fiber Optics" uses the new FOA textbook and online reference guide to OSP to help you learn about OSP fiber networks. The "Understanding OTDRs" self-study program will help you learn how to properly use these complicated instruments and there is a free OTDR simulator you can download to use for practice. Standards cover components and systems and how to test them, but rarely get into installation issues. The FOA NECA 301 standard which covers installation of optical fiber systems has been revised for the second time, adding considerable new materials. This standard is derived from FOA educational material put in standards form and approved by ANSI as an American National Standard. It's specifically written to be used in contracts to define "installation in a neat and workmanlike manner." The standard is available from NECA. Here is a list of the Lectures now on YouTube. View the FOA YouTube video Lectures. When do you use them, how to find distance to fault, what effect does end preparation have on traces, more. What does this new method of measuring mode power distribution in MM fiber mean to testing standards? Installing copper/fiber/wireless for premises networks. Bend-insensitive fiber is a "hot topic" now - we try to explain how it works and what it means for installation and test. 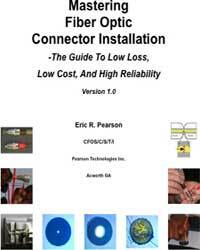 Lots of new materials added to this introduction to fiber optic network design. Data centers are the heart of the Internet, storing and supplying data for user requests. Needless to say, high performance cabling is needed to move the data between storage, servers and routers. We've created a new pagein our Online Reference Guide on data centers - how fiber and cabling are vital to their performance. Karen and Jim Hayes of FOA recently visited APSI in Charlotte, NC. APSI is a veteran-owned training organization that provides a wide spectrum of tech training including fiber optics for FOA certification. In addition, APSI offers training in personnel issues including finding jobs and successful applications for them. Yes! The camera in your cell phone is sensitive to infrared light - lots more than your eye - and can detect light in an optical fiber or from a transmitter. Chris Hillyer,CFOT/CFOS/I, Master Instructor, Northern California Sound & Communication JATC sent us some photos showing how this works. See below or the video now on YouTube. Q: Epoxy, Hotmelt, and Anerobic Adhesives - why each is used in in what situations. A: Epoxy/polish are used where highest yield, lowest cost and max reliability are needed. They are used for all factory made patchcords and a reasonable percentage of field terminations. The downside is they require an oven to cure the epoxy quickly. I actually invented a AC/battery-powered oven for use in the field that is still available - http://www.afsi.us/product.php?product=CURING to simplify the field use of epoxy. Anaerobic adhesive is used when you are looking for low cost and fast field termination. You can use it with an "accelerator" solution that gives practically an instant set to the adhesive but with some loss of strength/reliability. We developed a method with no accelerator that the Navy uses because it's more reliable. The big difference with epoxy is the cured adhesive does not have a drop (epoxy bead) on the end of the ferrule that makes polishing virtually foolproof. HotMelt (a 3M product) has the adhesive already inserted in the connector, so you just heat the connector up, take it out of the oven and insert the fiber. As soon as it cools, it's ready to polish. It has the adhesive bead on the end of the ferrule so polishing is easy. Against it is cost ($5/conn vs $1/conn for epoxy and anaerobic connectors) with essentially the same labor cost, a very hot oven (twice as hot as epoxy) and the need for AC power on site. This technical report is intended to show the background of encircled flux for the characterisation of multimode launch conditions. This includes the selection of the encircled flux and the definition of the encircled flux requirements in conjunction with the implied variation in attenuation measurements." Lines 490-492 from the draft document say it matches VCSEL launch conditions considered in 10 GbE. Lines 493-395 say it is close to the mandrel wrap mode conditioner used in TIA standards for many years. That is a very useful conclusion. That's Why They Call Them "Dust Caps"
Q: We clean a connector, inspect it to ensure it is clean then put the dust cap on. If we inspect it after we remove that dust cap, it's dusty again, we assume from dust in the cap. I have tested different types and makes of dustcaps for the LC and clean ones are rare. If you only push them on half way it helps.....sometimes, but not always. Does any company make clean (guaranteed) ones? A: I've been saying for years that the reason they call them "dust caps" is they contain lots of dust. I know of no clean ones. Think about how they are made in millions and dumped in big bins in a factory! You just have to clean connectors when you remove them. Have you tried some of the dry cleaners? They seem to work well. Super WiFi has lots of promise for rural broadband, as usual, will be fed by a fiber backbone. FOA President Speaks At NZ "Rural Broadband Symposium"
More photos from the FOA trip here. Here's another controversy in the fiber optic business. It seems that some dry water-blocked cables have problems with salt water affecting the speed and amount of water absorption by the super absorbent powder (SAP seems to be a new industry TLA - that's "three letter acronym" - for super absorbent powder) used in these dry water-blocked cables (DWB?). It seems that salt water performance has caused some users to not use this cable anywhere that it may encounter salt water. But according to an article by Ryan Chappell of Coats, a manufacturer of the yarns used in fiber optic cable manufacture as well as SAP, there are big differences between the absorbency of materials from different suppliers. We suggest you 1) read the article in Lightwave, 2) check out the Coats website and 3) ask your fiber optic cable manufacturer about their cable before installing it in a salt-water environment. From the TIA PR. You can download the entire report at TIAonline. A new newsletter about the wire and cable (and fiber optic) industry in Asia is available online. See http://www.read-wca.com/ for more information. Fiber is an important communications tool for wind farms. In this webinar, you will learn some of the driving forces behind the evolution of wind power systems as well as the design challenges, specifically in the area of data communications. Solutions for high-reliability communications links using optical fiber technology will be presented. These solutions offer the galvanic isolation and electrical noise immunity required to address wind power system needs. Avago Technologies products meeting the needs of wind power system designers will be profiled. Check with Corning for availability. The National Association of Electrical Distributors has created a nice overview of "smart grid." It covers a brief overview of the US electric power system, an understanding of why the smart grid has become a national priority, a snapshot of the various electrical components and concepts that are part of the smart grid, advice on how your business can get involved and a look at some key players who should be on your radar if they aren't already. Go to the NAEC Smart Grid website and download their Quick Start Guide. Information Gatekeepers Inc. (IGI), a leading international supplier of information on fiber optics and telecommunications markets and technology, has entered into an arrangement with Google to make its archives available as Google eBook. Since 1977, IGI has been publishing newsletters, conference proceedings, market research reports, and other publications focused on worldwide markets in telecommunications and fiber optics. With Google eBooks , all of these publications and studies — including previously unavailable earlier works — are now available in searchable, electronic format to market researchers, financial analysts, lawyers, governments, university researchers, libraries, and all other interested parties. Please search our new archive by visiting igigroup.com or entering search terms in the box below. The new Google eBooks of IGI publications are also the best available for reading on mobile devices. 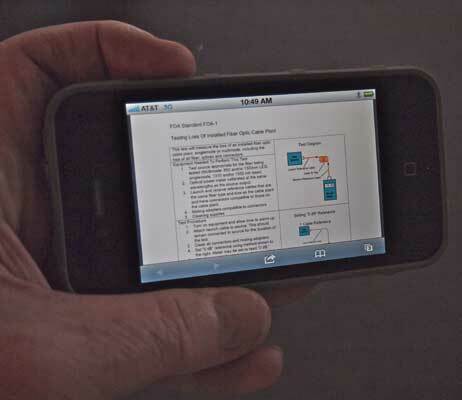 Google eBooks can be read on the Web, Android phones, iPhone, iPad, iPod touch, and supported eReaders. Learn more about our supported devices. For more information on the new Google eBooks of IGI publications please visit igigroup.com. You can search Google Books for IGI publications directly - Go here. Yes! The camera in your cell phone is sensitive to infrared light - lots more than your eye - and can detect light in an optical fiber or from a transmitter. Chris Hillyer,CFOT/CFOS/I, Master Instructor, Northern California Sound & Communication JATC sent us some photos showing how this works and the following description. "Your cell phone camera's image sensor can read IR light. It uses this technology to help take pictures at night. In the advanced audio and CCTV field they have been using the smart phone camera to trouble shoot problems in IR communications. The human eye cannot see the IR light emitted by let’s say a remote control. Well up until now we would always say that the remote is out of batteries, or either the IR transmitter or IR receiver was not working properly. Now we can use your smart phone camera to see the IR light emitted by the IR transmitter. All you have to do is turn on your camera function on your smart phone and hold it up the remote control and push any button. The cameras screen will show the IR light. Now back to Fiber Optics. If you follow the same principals of the last paragraph, let’s say you wanted to check if a fiber port was energized. You can either use the card that is supposed to show you in a few seconds that the port was hot. Or you could plug in your meter, in this case it takes some time to find the card or if you don’t have your meter handy. Just pull out your smart phone turn on the camera and hold it over the port. If it is hot you will see a bluish white dot in the fiber bulk head (see attached pictures)." We tried this ourselves and found our camera phone very sensitive at 850 nm but as expected less so at 1300 nm, like all semiconductor detectors. Our phone could still see 1300 nm sources at around -20 dBm, making it very useful even for LED sources, and of course, perfect for lasers. Seeking Fiber Analyst for long term role based in Mountain View, CA. Excellent pay and benefits, GREAT team and work/life balance. Strong technical knowledge of DWDM based optical transmission systems design (Networks, Devices, and Technology), component qualifications, system simulation and link budget analysis. Fiber testing, CD, PMD, OTDR, ILM. 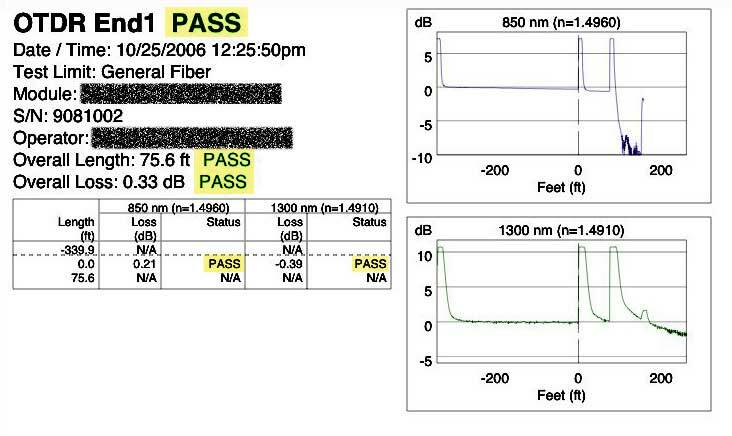 Analysis of Fiber Optic Test Results. Design and execute system test plans. Survey existing fiber networks to enable the production of new fiber designs. Implementing engineering scope of work. Perform formal and informal training on solutions and technology as required. Document results of tests and system designs. Communicate results, issues, next steps, etc. to partners, customers, and management as needed to resolve problems. Bachelors degree in Computer Science, Electrical Engineering or equivalent work experience referred. Three to 5 years DF testing, Fiber Analyst. Ability to troubleshoot complex FC issues to resolution. Knowledge of ODF, Patch Panels. Eligible to work in the US without sponsorship. Travel to other locations as required. Travel 80 to 85%. Plan, facilitate and manage expansion work in Data Centers, POP’s. It’s long term (couple of years), about $45 per hour, maybe a bit more for the right person. Plan, facilitate and manage expansion work in Data Centers, POP’s. Work closely with the technical negotiation team to understand terms of existing and new contracts and arrangements including delivery targets and specific technical requirements related to space, power, cooling and rack build out, DF, OSP, ISP. Communicate target completion dates and ensure that all internal requirements are being met in a timely manner. Strong project management skills to serve as primary vendor contact for the delivery of space, power, HVAC, racks, cabinets, dark fiber for new builds and expansion of existing sites. Technical knowledge of DWDM based optical transmission systems. Strong knowledge of Telcordia GR 1275, 1502, 2981, NFPA requirements. Strong understanding of interconnectivity requirements within carrier hotels including LOA/CFA, physical interfaces, cable types, connector types. Strong understanding of risers and all aspects of ISP. Strong Experience with planning and delivery of space, power, cooling and inside plant fiber, risers, routes and documentation of same. Strong Experience with AC Power, UPS, Rectifiers, DC Power, Battery Plant, HAVC, Grounding. Hands On background in proper fiber cleaning procedures, radius bend and fiber running procedures. Connector types, fiber management, understanding, use of light meter, light source, understanding of OTDR shots. Good understanding of OSP and interconnection hand off between OSP and ISP. Demonstrated organizational project tracking and communications skills. BS Degree in a technical discipline or 6 years in a telecom related field. I’m looking for a couple of techs for a 2+ year project that’s based in NorCal doing trace analysis and audits nationwide. As the pay range is between $35-40 per hour, this would be a good opportunity for someone who has the training and experience and is certified. I’m also looking for a couple of FTTx Design Engineers for a contract-to-perm role in Lincoln… these are just a couple of examples of what I’m hiring for. Are you crazy about new technology and how the communications space is changing to meet the expanding bandwidth requirements in the communication age? Have you spent five plus years in the field working directly with fiber and service providers and want to move into a product development role that solves problems up front? If working with a dynamic team and some of North America’s top triple play service providers is a direction you want to take your career, please email a covering letter stating your experience and your resume to dhammersley@vplenterprises.com. telecom industries. We offer turn-key and OEM solutions for CATv, Copper and Fiber termination boxes in a series of off-the-shelf products as well as ready-to-install customized enclosures. At Primex, we makeeverything fit – so you don’t have to. You will work collaboratively with internal teams and customers to build on product offerings using existing ideas, and will use your industry experience to prioritize and develop new features and designs. You possess a unique blend of business and technical acumen and have the ability to see the ‘big’ picture. You have the determination to make the company’s vision a reality and enjoy spending time in the market to understand customer issues and develop innovative solutions. To work in close collaboration with Telecom sales, engineering, customers and prospective clients to design and build market ready optical fiber, copper, wireless and OEM network termination, demarcationand connection enclosures. Assist in strategically sourcing specified components and alternates and follow through to completion all relevant certification processes and requirements for the Telecommarketplace. The Fiber Optics Engineer/Technician is the technical sales support resource responsible for working with front line sales teams, marketing, customers and engineering teams to conceptualize,design and execute the development and market acceptance of Primex solutions. Responsibilities: Capturing detailed requirements and ensuring that our internal mechanical engineering team understands all requirements & develop products that are consistent with our brand and appropriate for the marketplace. Direct relationship management with external customer engineering teams to develop solution- focused products. Building and maintaining business relationships with any partners and suppliers necessary to ensure the success of the products, including vendor selection. Research and analyze customer design proposals, specifications and other data to evaluate the feasibility, cost, and maintenance requirements of designs or applications. Assess customer network specifications and assist in procuring specified components and work towards value engineering part substitutions where possible to increase value. Perform research and report on competitive products; assist Marketing and Sales with developing differentiating product positioning strategies. Provide technical customer service in coordination with Sales as required. Train internal staff on market trends, new technologies and specifically the expanding role of fiber optics in the communications space. This role will require someone with extraordinary technical abilities gained through on site field experience. An academic background in Electrical Engineering would be highly relevant. Direct multi-year, OSP experience in the telecommunications, fiber optics and cable television market space. Solid understanding of the telecommunications market and specifically the role of fiber optics in relation to FTTx market. Direct experience with the last mile equipment, termination and technologies – Fiber and Copper. Thorough understanding of role and evolution of both active Ethernet and PON networking systems as well as working familiarity with RFoG systems and new triple play technology developments. Familiarity with compliance engineering, UL, CSA and/or Bellcore/Telecordia. The ability to research and anticipate technology trends is essential in addition to understanding competitors and their ‘roadmaps’. Strong problem solving skills along with excellent verbal and written communication skills. Intellectual curiosity, creativity and a passion for technology would be advantageous. Project management skills demonstrated through a PMP designation or work experience. Demonstrated ability to understand and develop plans and strategies to clearly communicate complex business issues and technological solutions. Fluent communication skills in English both written and oral. Ability to effectively work with cross-functional teams and various geographical locations. Willingness and ability to travel within North America to support Sales and Marketing efforts. This position will be based at our Primex Headquarters in Vancouver/Langley, BC, Canada. Check out our website at http://www.primextelecom.com/ to learn more about our company and our flexible enclosure solutions for the communications space. Interested and qualified candidates should email Donovan Hammersley, VP of Sales and Marketing, at dhammersley@vplenterprises.com. Only qualified candidates will be contacted for future follow up. We have an immediate opening for a Communications Installation Technician in the Alaska market. We are also expanding our installation crew in the PNW market and would like to interview candidates for open positions. Growing company in VA has an opening for a Fiber Optic Engineering Specialist who will support company's existing fiber optic products as well as participate in R&D projects. We are currently seeking applications for additional instructors in our area to enhance our teaching capabilities. If you know of any instructors in Central and Southeast Florida seeking Part Time assignments, please have them fax their resume to me at (954) 979-0456. The successful Senior Electrical Engineer will lead the identification, sourcing, development, and integration of novel electro-optical sensing systems for surgical robots. The candidate must be able to identify and evaluate new candidate technologies, work with vendors to customize hardware and software to meet specific requirements, and drive robust technical solutions into production. He or she must excel in a high-energy team environment and be capable of making sound decisions when faced with the time pressures and incomplete information typical of new product development. The successful candidate must have outstanding technical depth in relevant areas, but be as comfortable leading and specifying as designing. No Tech puzzler this month. Go here to answer the question. Be sure to enter the month of the quiz! Check here next month for the answer to previous tech puzzlers. The article above covered the different OTDR traces you get with cleaved or broken fibers. 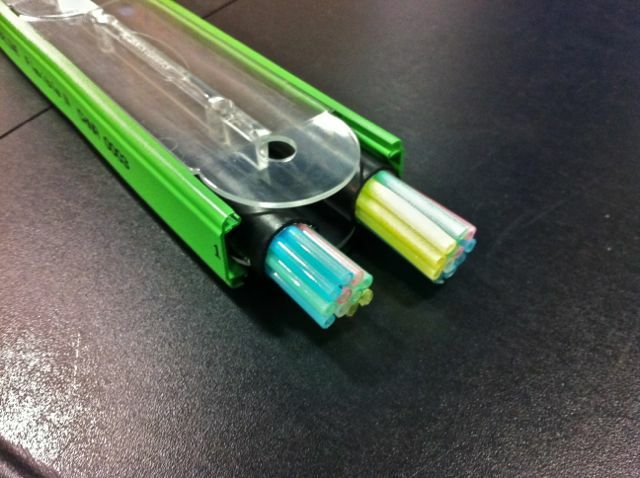 What would the end of the trace look like if the far end connector was an APC type? What was the first application for which VCSELs were used? B. Gigabit Ethernet was the correct answer. 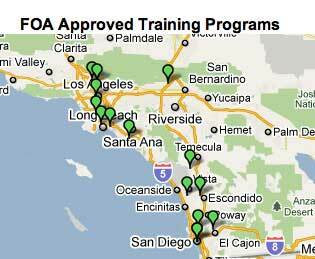 See the FOA Reference Guide for more info. 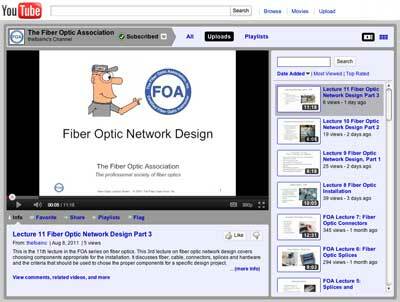 (C)1999-2011, The Fiber Optic Association, Inc.
Go to the special answer form to enter the FOA Tech Puzzler monthly contest.